For the past several months, I have been carrying a digital camera virtually everywhere I go. Keeping a camera continually available optimizes potential for capturing choice pictures. Also, a camera within reach provides countless opportunities to sharpen skills while experimenting with camera options. Indeed, the consistent use pays off — I am learning many new photographic tricks simply by playing with settings during free time. Further, increased familiarity with the device enables greater agility when reacting to spontaneous, time-critical photographic events. The content of your photographs is greatly influenced by where you take your camera. Quite simply, exposing your camera to new environments and perspectives will vastly increase the diversity of your photographic content. Using your camera in fresh locations provides insight and new ways of looking at things. Suddenly, a drive to the store becomes a thousand photographic opportunities. A day at work evolves into a mindful exploration of potential photographic subject matter. If you are serious about learning the fine art of photography, maximize the variety of subject matter available to you by carrying your camera everywhere. Sony DSC-V1 Cybershot Currently, I carry a Sony Cybershot DSC-V1 5.0MP digital camera. The camera records on proprietary “memory sticks”, which are nowhere near as expensive as they were even one year ago. I recently upgraded to a 1GB memory card, and now also carry a 125MB card as backup. For my purposes, I find that 1GB is more than enough storage capacity, and have not yet needed to use the backup card. 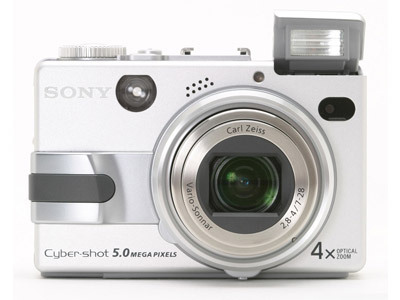 The camera provides a built-in flash, nightview, and nightshot, as well as infrared focusing, red-eye removal, and many other optical features. The camera also records MPEG video and animated GIF sequences. The camera’s options and settings are extensive, including an automatic, “quick-shot” mode, as well as a complete manual mode and several other preset modes. Time constraints typically determine the type of photographs captured. Generally speaking, the more time available, the more creative the photograph. For example, when time permits, time is taken to study the subject matter, exploring perspectives and considering strategy. On the other hand, rushed moments tend to restrict photographic considerations such as composition or lighting. Such photos serve well as rough drafts, preliminary studies, or even spontaneous journalistic exercises. When no time is available to actually use the camera, it is beneficial to mentally explore the environment for future photo opportunities. With continued exposure to new subject matter, the mindful photographer will gain much experience and greatly improve essential photographic skillz.